Following on from last week we are venturing up the Fairfield-Leopold Road and it really is in pretty good condition for a gravel road, though it won’t last as more four-wheel drives bounce along to visit Windjana Gorge. 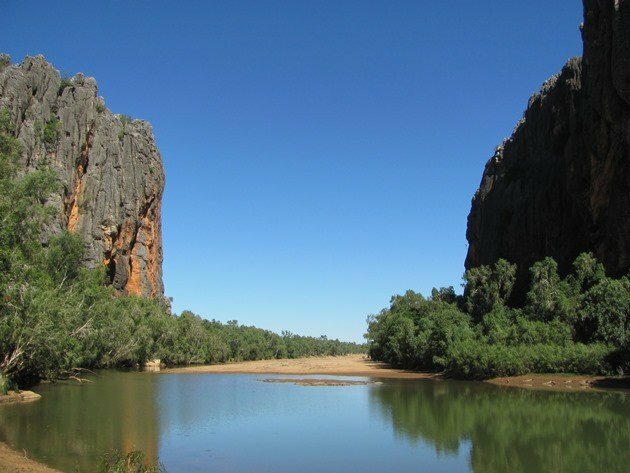 It has been almost two years since we last visited Windjana Gorge and it is earlier in the season this year and as you can see by the photo above it is an impressive gorge. It was a cool start to the day and just after we entered the gorge we were faced by huge numbers of crocodiles resting up in the sun. In fact the first small island held 52 crocodiles! 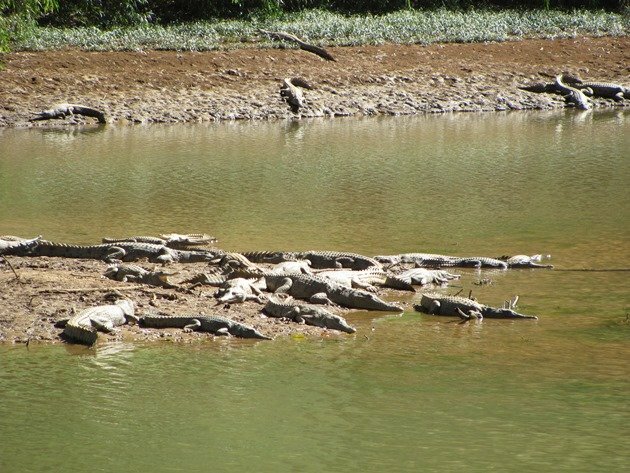 We counted almost 150 crocodiles and no doubt we did not see them all! 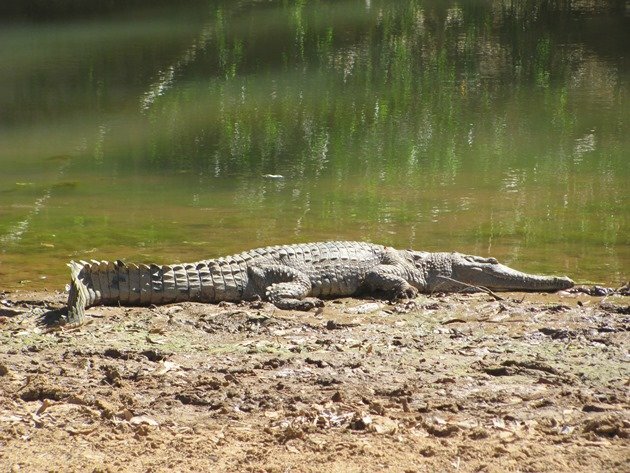 You drop down into the gorge riverbed and wander along observing the crocodiles from a distance. There are some very large crocodiles in the gorge despite them only being the smaller species of crocodile-namely “freshies” rather than “salties”. Freshwater and Saltwater crocodiles can inhabit the same water systems, so you should never presume there is only one species present and either species can inflict wounds. 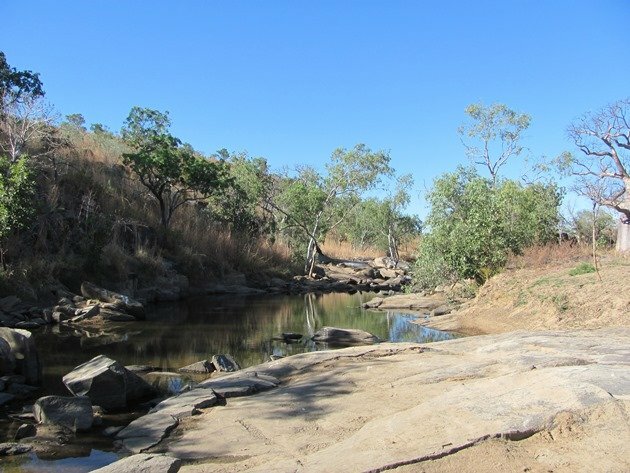 Swimming is not advised at Windjana Gorge and there is a notice showing a wound inflicted on somebody who chose not to heed the advice of the authorities. The walk takes you through the trees further into the gorge and the bird-life was abundant and there was once again the constant call of the Striated Pardalote and more nesting taking place. One patch of trees was particularly noisy and there were large numbers of Australian Figbirds among them. White-gaped Honeyeaters, Yellow Tinted Honeyeaters and Brown Honeyeaters were prevalent and there was the constant screeching of the Great Bowerbirds. The trail led to a bower where the birds were displaying plenty of small white snail shells from the river and also bones and other items they had found and carried from nearby. 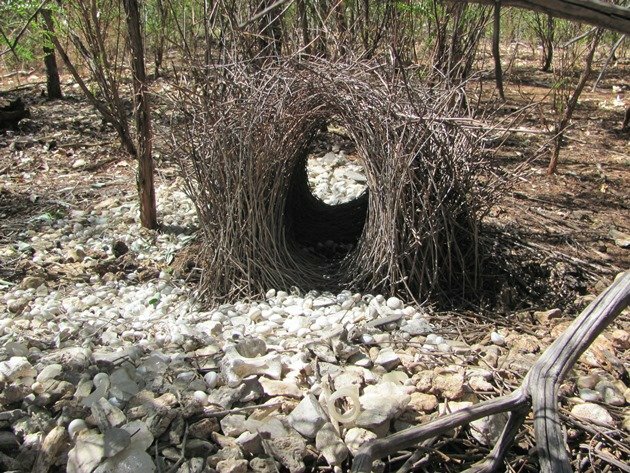 They would be hoping to impress a female bird with the items in the bower enough to convince her that they were a good potential partner. The highlight on the far bank of the gorge was a Black Bittern sneaking along looking for food. The light was horrendous for taking a photo in that direction and we thought we were lucky to see one last year and had not expected to find one this year! It just goes to show you just never know what you might find sneaking around in the shadows! 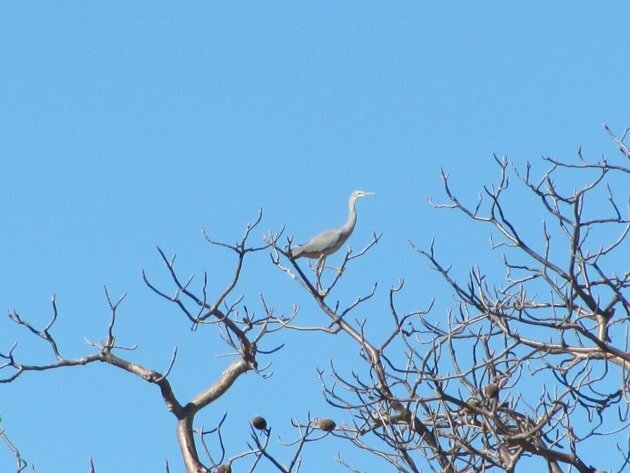 In fact as we walked back towards the exit to the gorge we realised we had a White-faced Heron sneaking along just below us on the edge of the water. It had one dislodged feather, which looked rather odd and would no doubt soon fall out. Just as we were about to exit through the gap in the rocks we heard a call, which sounded like a Sandstone Shrike-thrush. With all the imitating that was going on with the Great Bowerbirds you do tend to take some calls less seriously, but this was a significant find if it was truly a Sandstone Shrike-thrush. 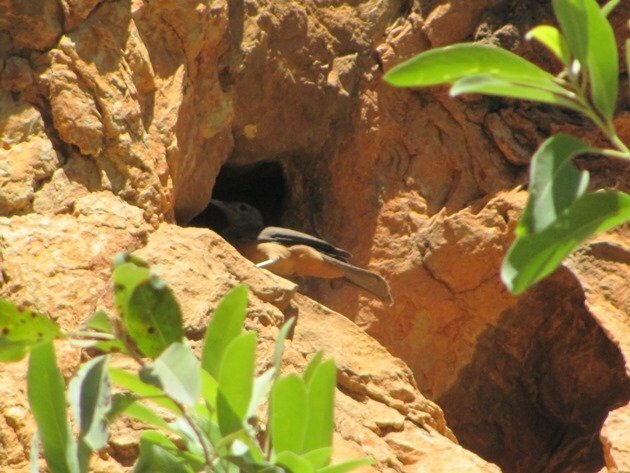 Sure enough there was a Sandstone Shrike-thrush and it was nipping in and out of all the rock cavities grabbing at cobwebs. It flitted around and it was hard to capture the action as it blended in well with the rock colours. 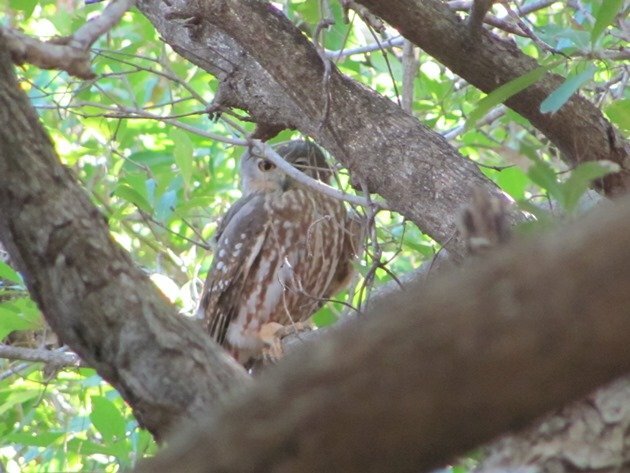 In fact last time we saw one at Hidden Valley National Park they were equally well camouflaged and hard to photograph! Following our visit to Windjana Gorge we continued up to the Gibb River Road, which is a gravel road between Derby and ends close to Wyndham at the other end. We only travelled for about an hour to go to a spot we know there can be remaining water after the Wet Season. With the rock base in parts of the creek some water remains and supports a small number of birds. Just like at the quarry the previous night the smallest amount of water appeared to be enough for one White-necked Heron, one White-faced Heron and one Black-fronted Dotterel. We wandered down the creek-bed to see what other small pools of water remained and could hardly believe it when we accidentally flushed a Black Bittern, the second in one day! 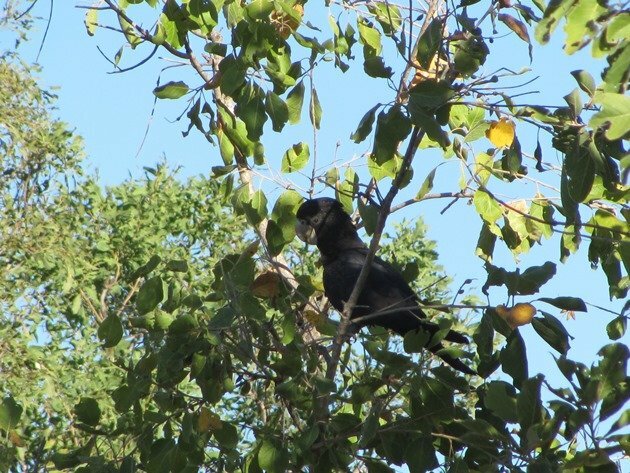 Further long the trees were noisy with the sound of Red-tailed Black Cockatoos as they crunched away at the seedpods. The variety of birds in the area was impressive as always and many indicated the presence of water. 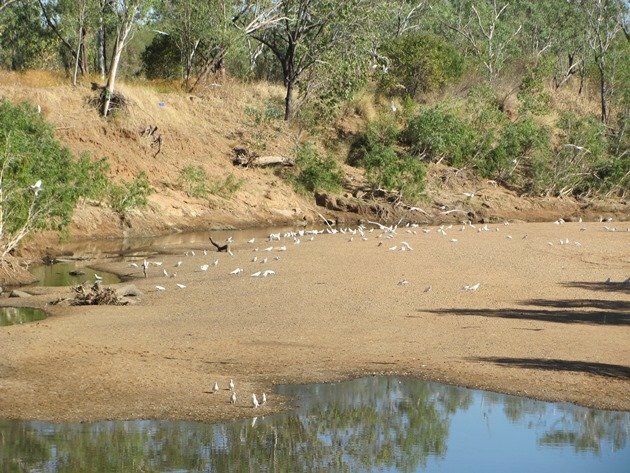 An observation of doves and finches in the bush always indicates there is water nearby. 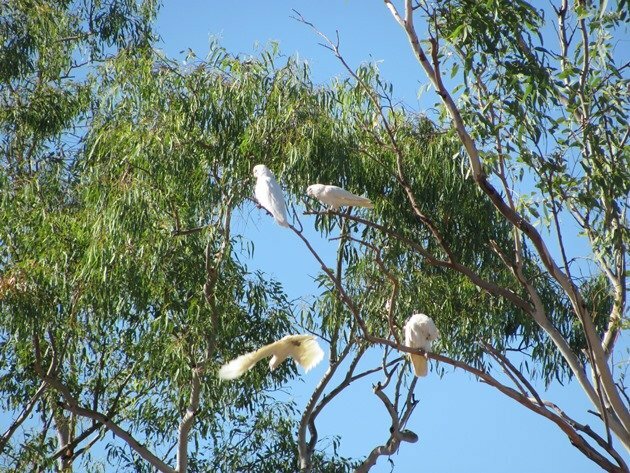 The following day we headed west towards Derby on the Gibb River Road and at the Lennard River there were huge numbers of Little Corellas drinking at the remaining water. It appeared they may have roosted there during the night and it would not be a peaceful spot to camp! We visited the ephemeral lake 20 kilometres south of Derby once again and the variety of birds had changed significantly since our last trip in May. 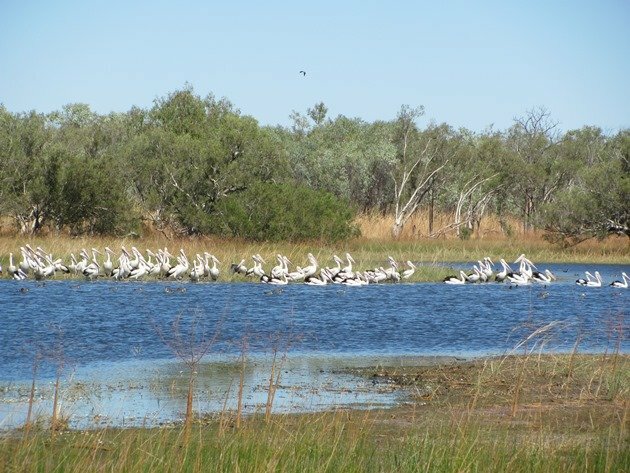 There were huge numbers of Brolga present and even more impressively were 76 Australian Pelicans. 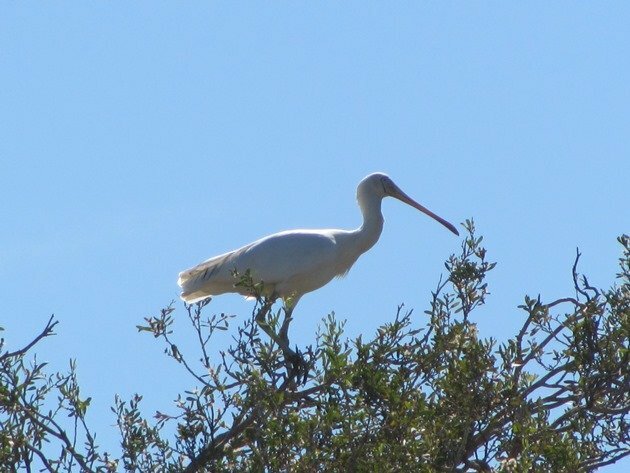 All three species of Ibis-Glossy Ibis, Straw-necked Ibis and Australian White Ibis were present this time. Little Pied Cormorants and Little Black Cormorants were roosting in the shade and the water was covered in ducks and Eurasian Coots. 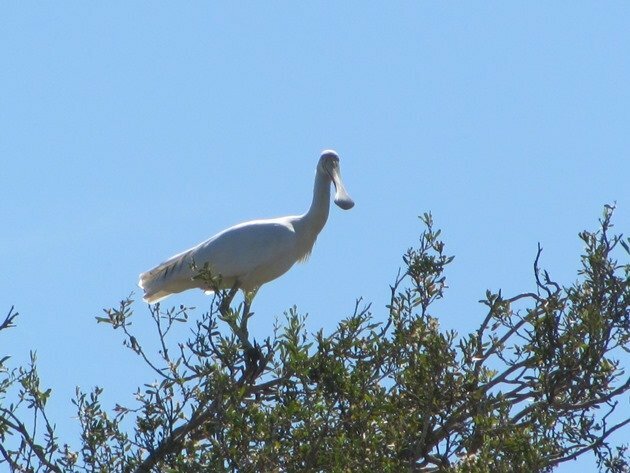 We were surprised to find two Yellow-billed Spoonbills at the lake, because it is more common to find Royal Spoonbills in the area. 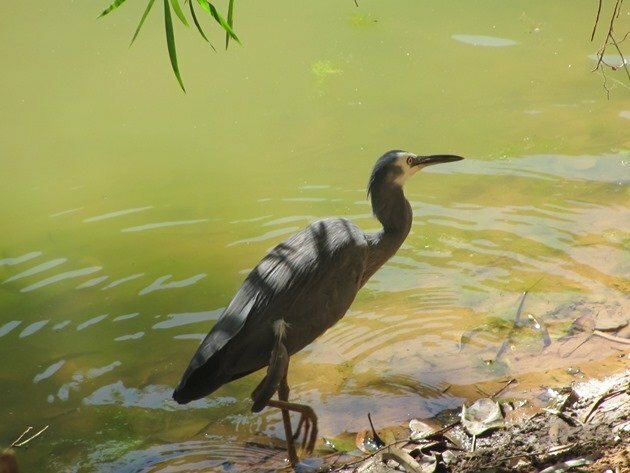 Over 60 species of birds were present during our walk around the water’s edge in the shade of the trees. Our bush camp was not too far from Willare and we heard Barking Owls during the night, so a walk in the morning was hopeful of us possibly finding them. It was not as easy to get a photograph due to the dense bush and as expected you don’t see them until you flush them and they fly forward a few metres. We left the pair of them to enjoy the rest of the day in peace and quiet and we headed home. Meanwhile, once again, we are somewhere in the bush out of phone range and enjoying what the great outdoors has to offer in this part of the world. Hopefully we are having a few birding surprises too! What a cool place to go birding! Again, a breath-taking post. Well, there could have been more mention of deadly snakes, but the crocodiles made up for that. We only saw two snakes, so I forgot to mention them!! Johanna-best to keep away from the water’s edge and do not clean fish near the water and you won”t see the one that gets you…..so be very careful. Even a freshwater crocs can be bigger than a grown man. Saltwater crocs can be over 200kms from the coast.